JLM Diesel Particulate Filter Cleaner is one of the best diesel particulate filter cleaners on the market. 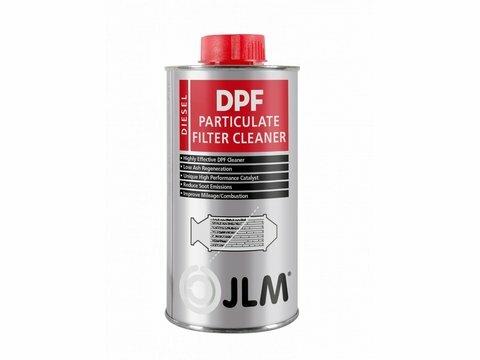 JLM DPF Cleaner contains a high concentration of the active additive. 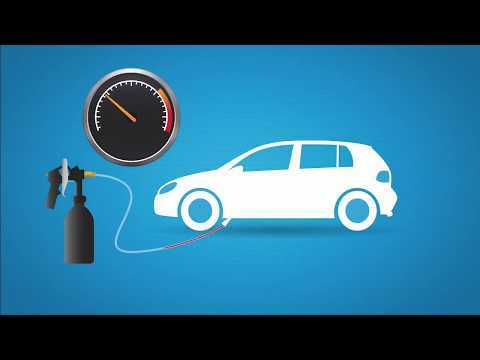 All modern cars with a diesel engine have a diesel particulate filter. The filter captures incompletely combusted fuel (soot) from the engine that would otherwise end up in the environment. In the course of time the filter becomes full. The car's electronics ensure that this soot is burned during motorway driving or when the engine is under a heavy load. This is known as regeneration. However, many cars only make short journeys as a result of which the engine is hardly under any load at all. As a result, regeneration does not occur and soot continues to accumulate in the diesel particulate filter. Eventually the filter becomes blocked, the orange warning light with the diesel particulate filter symbol lights up on the dashboard and the car has to be taken to the garage. JLM Diesel Particulate Filter Cleaner solves this specific problem. There is no need to dismantle the diesel particulate filter. This saves time and therefore money. Add the contents of a bottle to a full tank of fuel and drive the car again. The cleaner ensures that the soot in the diesel particulate filter burns at a low speed, when the engine is under a light load and even during short journeys. On top of this JLM Diesel Particulate Filter Cleaner reduces the HC and CO emissions and soot emissions by no less than 20 percent. A can of cleaner could be the difference between passing and failing the MOT test. In addition, JLM Diesel Particulate Filter Cleaner ensures that fewer soot particles are deposited in the filter, meaning that the customer visits the workshop less often. JLM Diesel Particulate Filter Cleaner also conditions the engine and diesel particulate filter for a longer period of time with better performance and lower fuel consumption as a result. Conventional cleaners contain iron to initiate the regeneration process. 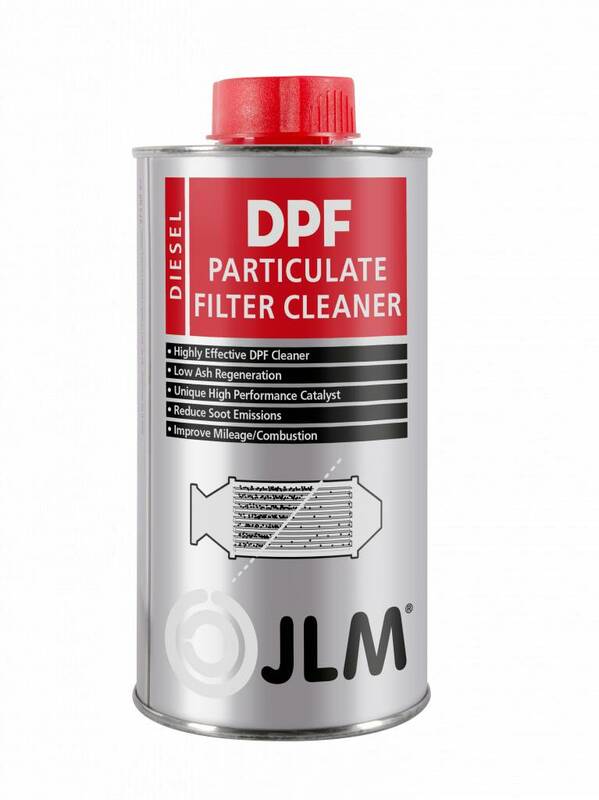 JLM Diesel Particulate Filter Cleaner comprises a high concentration of a patented platinum-cerium compound. The combination of platinum and cerium ensures, in the first instance, significantly improved regeneration and cleaning of the diesel particulate filter compared with conventional cleaners. The higher the concentration of platinum the better the regeneration. Because JLM cleaners contain less iron than other manufacturers' cleaners there is also a smaller build-up of ash in the diesel particulate filter. As a result, the service life of the filter is prolonged. Other manufacturers add more iron to the additive to achieve the same results and advantages as JLM. The result is an increase in the amount of ash in the filter, which means that the filter has to be cleaned more often and does not last as long. For this reason, manufacturers of conventional cleaners reduce the amount of iron in the additive. This results in a drastic decrease in the regeneration performance. This is why you should use JLM Diesel Particulate Filter Cleaner. JLM Diesel Particulate Filter Cleaner restores the exhaust system and with it the fuel consumption, power and emission of exhaust gases to the original factory condition. JLM Diesel Particulate Filter Cleaner is proven to be suitable for passenger cars, commercial vehicles and heavy duty diesel retrofit systems. Once the filter has been cleaned using Diesel Particulate Filter Cleaner it can be preventively maintained using Diesel DPF ReGen Plus 100 ml.